I have just been asked if I knew anyone that might fit this job in the invoice finance sector - so here are the details in case anyone is interest or knows someone that is looking for a job like this. It's a sales role as the number 2 at a new single invoice finance company, based in North Kent (a sales background is not essential). They can offer a basic of £85K+ with an unlimited bonus scheme. They are looking for a "top drawer" candidate that has proven performance, and extensive contacts so the candidate can deliver actual new clients quickly. 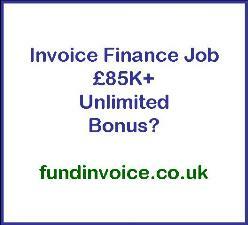 If you are interested, or know someone that might be, please send your details to info@fundinvoice.co.uk and we will pass them on so that the invoice finance company can reply direct to you if they think there may be some common ground. Please note that neither FundInvoice LLP or Glenn Blackman take any responsiblity for any jobs that are posted, or candidates that respond. Posting a job vacancy, or forwarding applicant's details is not an endorsement of any employer (or candidate).